Yes, too bad, I listen to his organ music with great pleasure. I do recall that, after listening to the Helmut Winter recording and after reading Bruhns' biography (being a violin & organ virtuoso), for a moment I thought: well, could he be the composer of Bach's BWV 565? I have doubts. Bruhns was born and died in Germany. He did have a post in Copenhagen, but I don't know its duration. I wonder why those Amazon crooks think they can sell the disc for such a ridiculous price. Although I don't personally own it, I can listen to it all day long on the Naxos Music Library site. Which Christensen?? Jens E Christensen?? Do you know a link to this recording? heldigt nok at tiden går. 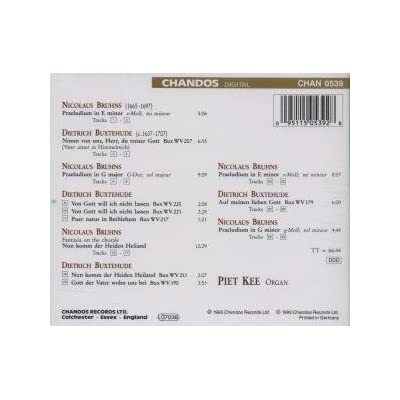 I'm looking for a good recording of the organ music by Nicolaus Bruhns! I own all these (and the P Kee) except the Foccroulle, which is on my wish-list. Listened to day to the Bruhns / Ghielmi and was not impressed. Most of the playing sounds stiff and unengaged in these ears, and this Ahrend organ in Milano strikes me not as being the best suited medium for this music. I can listen to the others in the run of the week. Wow! Didn't expect anyone to have (almost) all of them, not even you! Any impressions you could share wil be appreciated! He was German indeed, AFAIK. Born in Schleswig-Holstein, son of organist Paul Bruhns. Pupil of Buxtehude, who helped him to get the job at the Copenhagen Court. 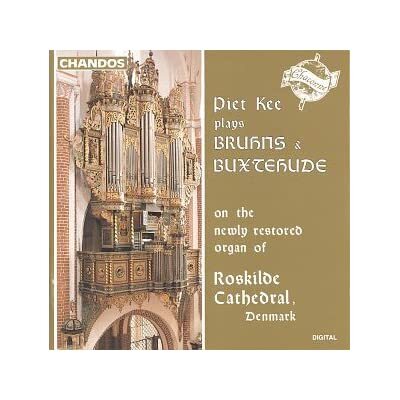 Buxtehude was Danish, but some scholars think he was (like Bruhns) born in Schleswig-Holstein (Oldesloe). Anyway, his roots may have been German, since there is a town near Hamburg called Buxtehude. Please give us a list of baroque organ cd's you don't own. A shameful example of underestimation! Well, I must say, that I am beginning to loose track of things. Actually I just realised that I do not - to my surprise - own the Bruhns / Flamme CD, but I am going to acquire it with my next order together with his Tunder CDs from CPO. I bet I may have some obscure organ works CD's (not necessarily Bach) you do not have, even though I am no nut of organ recordings. Of course you have, and probably quite a lot. Of course. Each of us thinks our collections are balanced based on our respective preferences. Just dug up this Chandos CD to play. Do you grow CDs in your backyard? Not true. A Bach collection which is made up of 80% of organ works cannot be considered balanced. It can be considered balanced by the person owning the collection. For example, 50% of the organ collection is on historical organs. This is nuts - screw balance. You seem to think, that mine is, but the share of organ works is far less.